A native of Barcelona and resident in New York since 1999, Alexis Cuadrado is an active member of the city¹s jazz scene. He currently leads the Alexis Cuadrado Puzzles Quartet, an outlet for his original compositions, and the band Alexis Cuadrado-Trio Ibérico, in which he explores his Spanish heritage mixing it with contemporary improvised music. He is also a founder of the bandleader collective Brooklyn Jazz underground. His new CD Puzzles will be published early 2008 by the new label Brooklyn Jazz Underground Records. This CD features Loren Stillman, Brad Shepik , Mark Ferber, Alan Ferber and Pete Rende and includes 9 ground breaking contemporary jazz original compositions. Alexis has also 2 previous CDs as a leader: Metro (Fresh Sound 2001) and Visual (FSNT 2004). These CD include all-original pieces and have received enthusiastic reviews from both critics and fans. He has also recorded over 20 CDs as a sideman and/or performed with such greats as Kurt Rosenwinkel, Bruce Barth, Ben Monder, Perico Sambeat, Mark Turner, Angelique Kidjo, Alguímia, Ben Waltzer/Bill McHenry Quartet, Chris Kase, Orquestra de Cambra teatre Lliure conducted by Lluís Vidal, Nuno Ferreira, Kris Bauman, Erik Jekabson or the Alan Ferber Nonet. He keeps busy freelancing with different bands in New York, the US and Europe. 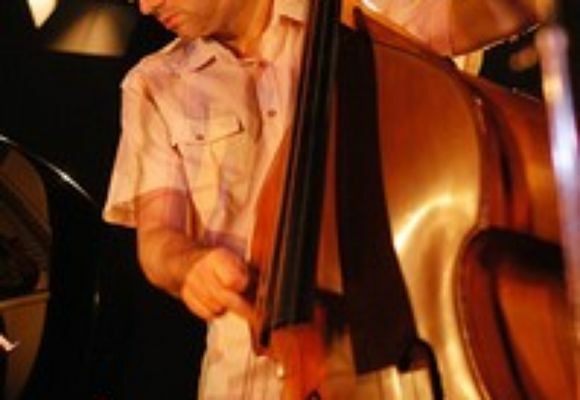 Cuadrado graduated from the Taller De Músics in Barcelona (1993) he went on to study with the legendary concert bass master François Rabbath in Paris (1995-98). In 2001 he obtained a Master¹s Degree in Jazz Performance and Composition at the Aaron Copland School Of Music-Queens College (NY). He has been active at teaching since 1993 and has been a guest lecturer and clinician in jazz schools and workshops worldwide. He is currently a faculty member of the New School for jazz and contemporary music in NYC. "Cuadrado exhibits maturity and emotional depth as a composer, bandleader and soloist." "Cuadrado's sextet makes an impression on Visual." "Visual is consistently good music by a smart, lateral-thinking musician." "Visual is a delicatessen for the true jazz gourmets." "There's no doubt about his distinctiveness"
"The Future of Spanish Jazz is in good hands"
"In addition of being an excellent soloist, Alexis Cuadrado is a high-class composer". "Cuadrado is hammering out a signature sound. "